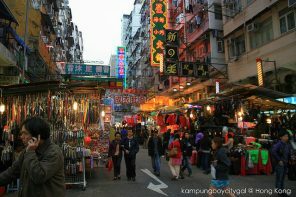 Sorry guys, it is a backdated post from my Korea trip. All the street food, fast food and captivating view from Jeju Island are sitting at my ‘to-post’ files. 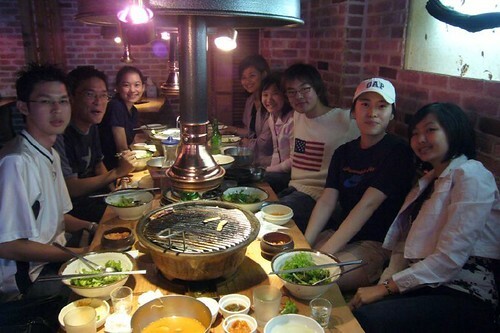 I’ll post one of the best meals that I’ve had in the city of Seoul – Korean BBQ. 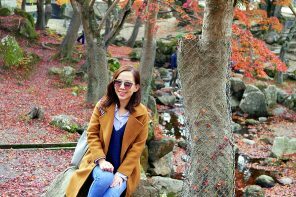 I’ve wanted to write about it ever since I got back, but unfortunately it’s not the easiest story to tell because I need to clarify with my Korean friends on all the mumbo jumbo name on Korean delicacies. 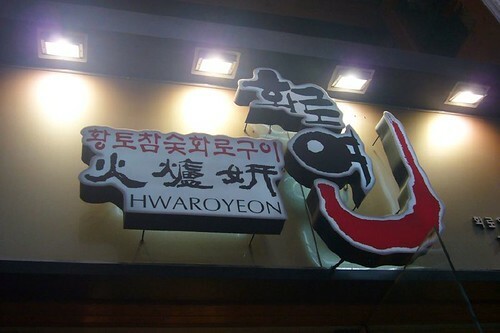 Eunji and Rome brought us to Hwaroyeon, a famous Korean BBQ place at Jong-Gak. We were welcome by a minimalist but modern interior. 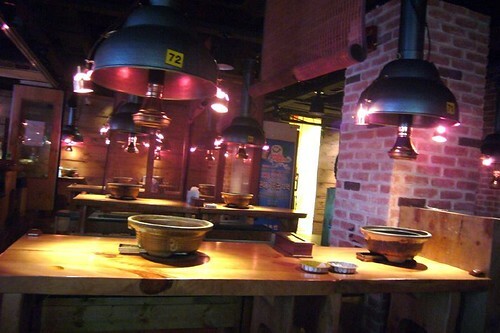 The place has that “village” style feel to it as its interior is mostly reddish brick wall with wooden table and wooden stools for you to sit. The subtle transmissions of light make the place dim but not dreary. This place is packed with happy patrons enjoying that special ambiance and food. I like this, a mini filtering funnel that drains all the excess oil away. I feel lifted up instantly because it sounds like a healthy meal with lean meats and refillable vegetables. 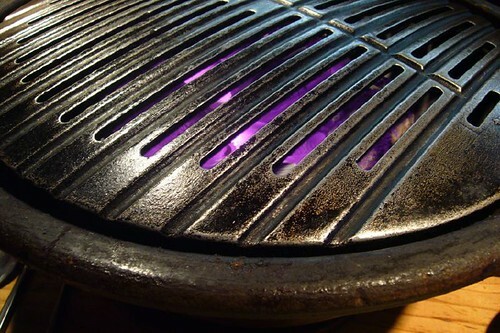 We spotted grills set with charcoal in the middle around every tables. 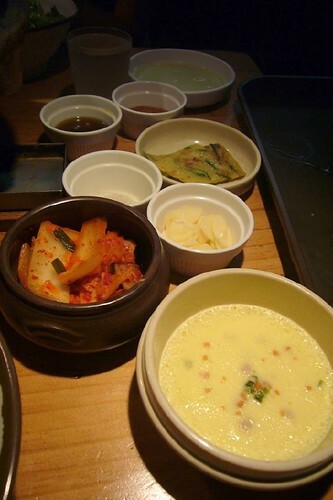 Traditional side dish such as kimchi, daikon (radish) kimchi and gyeran-chim (steamed egg served in small crock) are usually served in any BBQ joint. 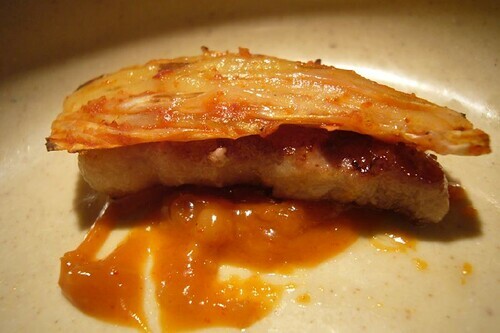 The Daeji Galbi (pork ribs) are marinated in a sauce made from fruit juice, rice wine, soy sauce, sesame oil and sugar. 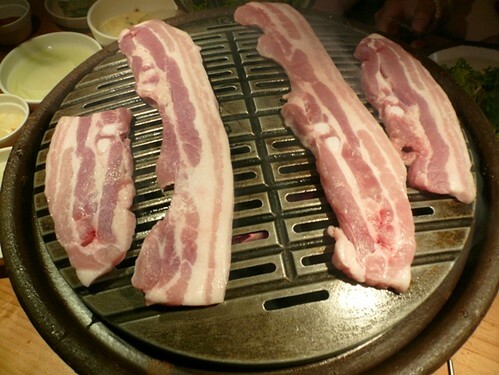 It is succulent in taste, crisply grilled to perfection with slightly charred around the edges. 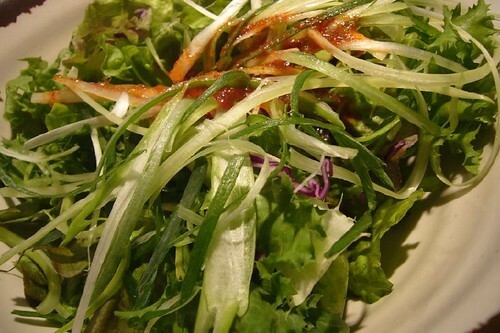 It has a good sweet and salty balance, and it is fun to tug the tender meat off the nub of bone with our chopsticks. 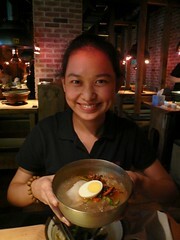 Samgyupsal (pork meat lard) is so sinful with the lards melting off in my mouth. The meat is usually cut in thin slices so that the marinade sauce can penetrate into the meat faster and to the meat will be cooked at a shorter time. This is like another version of our very own bacon, the beautiful layers of fats and meats create altogether a different texture: The bacon fat was crispy while the meat was slightly chewy. We used lettuce and pickled radish to wrap the meat, which is then dipped in ssamjang (sauce made of fermented bean curd and red pepper paste). Tada! What you have is a bite size sandwich! 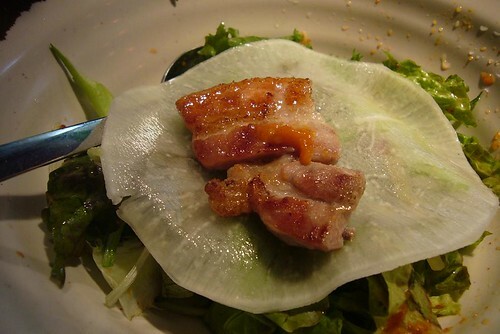 The multiple sensory pleasures of crisp lettuce juxtaposed with succulent grilled meat are irresistible. Eunji grilled like a pro, busy accentuating the taste, texture and moisture level of the cubes and cuts while talking to us. 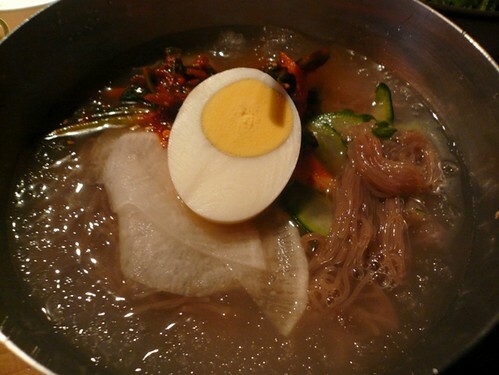 NaengMyeong (chilled buckwheat noodles) is often served followed by a galbi meal. 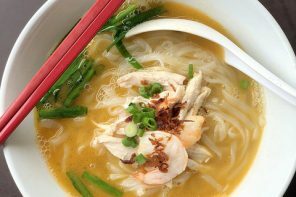 Served in a cold stainess steel bowl, the noodles sit in a tangy iced broth made of chicken stock, and are garnished julienned cucumbers, a slice of a Korean pear, and often a boiled egg. They slosh it full of shaved ice and it is sprinkled with sesame seed, in abundance. 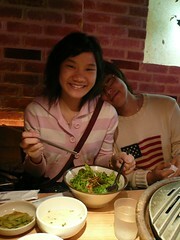 Victor Yong loves the noodles dish so much, just like how Na Hee loves it. Koreans love their soju. 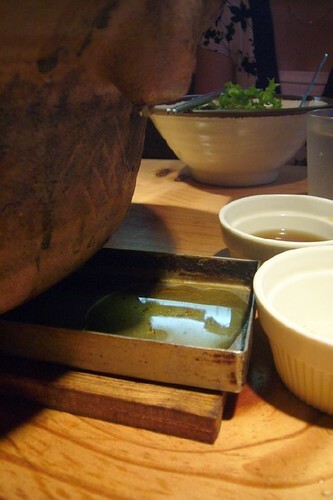 Almost every meal is accompanied by Jinro Shoju, a grain spirit produced by Jinro, the world’s largest soju company. It is served in small shot glasses and is so easy to drink and light. 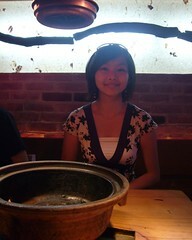 The huge feast ballooned us up like a puffer fish that is puffing too much. 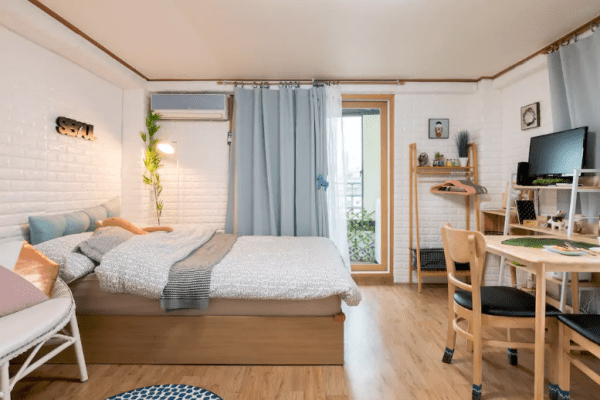 Talk about Korean’s hospitality! The service is excellent where waiters carry iron basket of fiery charcoal from table to table and the replace the grilling rack once it is charred. Wah looks really good. Shall forward this to my brother who’s currently working there. 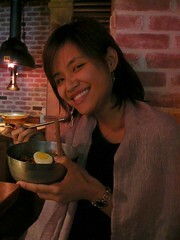 waaaahhhh,,,, i wan to eat!!! look at the spread! Yummy stuff. 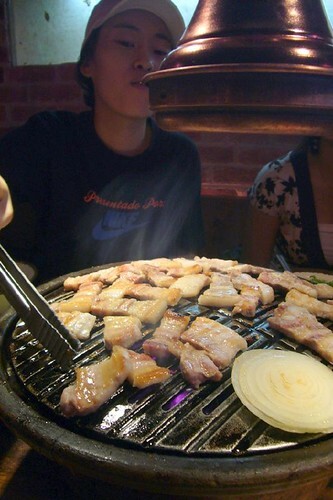 Love a good bbq esp korean one! wahshehhh look at the pokkkkk!